If you are here for the Mom's Day Blog Hop, please click here to go directly. Feel free to stop back to visit the Disney Pixar Blog Hop BELOW to be eligible to win more blog candy! 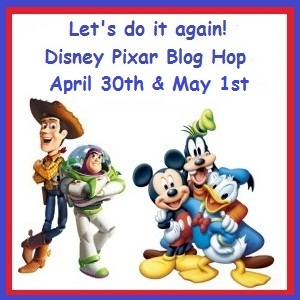 It is my great pleasure to participate in the reprised Disney Pixar Blog Hop. We all had such fun and a very positive reaction to the first hop ... more comments than I've ever seen! ... that a reprise is most welcome. Like the first version, this hop is co-hosted by my "pixie Sistah" Shawn at www.craftychicsblog.blogspot.com and Melissa at www.disneydreamerdesigns.blogspot.com. If you'd like to start at the beginning, go to Shawn's site by clicking HERE. You should have come from Madison's Funky Cards fun(ky) site. Hop along the Happy Trail... And DO make sure you stop back tomorrow, as there is different line-up altogether for Day #2. 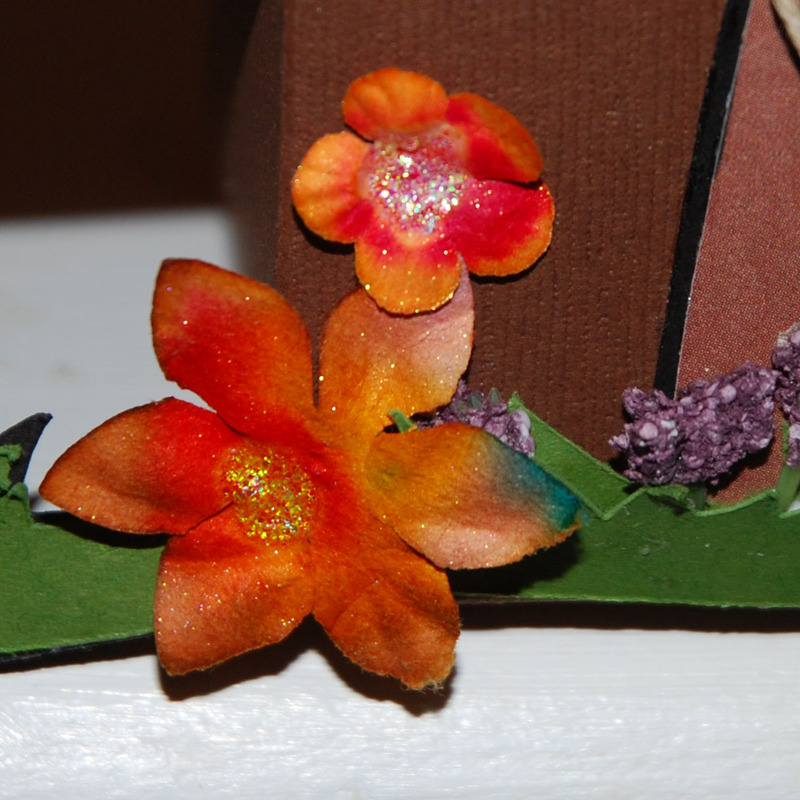 Glimmered flowers, sprayed with Creative Juices CardMonkey Glimmer Mist (homemade) and Stickles. Don't forget to the look for the hidden Mickey in the blog button of one of today's hop stops. You'll need this info to qualify for the Hop's grand prize of a Cricut GYPSY! This is absolutely adorable, Ellen! I know it must have taken a while to cut and assemble this thing but it was well worth the effort! Fantastic! I'm already a follower and just love your work. Love your project - very creative! My favorite Disney movie is Alice in Wonderland - if I really have to choose just one! Wow Love the Pooh house. 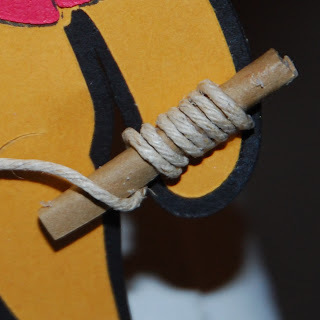 and the thread around the paper stick is wonderful. I guess the first Disney Movie I ever saw "Bambi" When it first came out is my favorite. TFS and continuing to offer the amazing blog candy that you do. Love your work! My fav Disney movie is 101 Dalmation. Thanks for sharing! WOW! You hit this one out of the park Sistah! You are so talented! Favorite Disney Movie . . . so many to pick from . . . Cinderella, Little Mermaid, Lion King could be my top 3. This is amazing! I love the 3-d gift box. Great job. What a fabulous project!! I love the way you've done the kite string. That's super! I've always loved and always will love the story of Cinderella - and Disney's version is a definite favourite. Peter Pan ranks right up there too! I love 3-D items@ This is AWESOME!!! My favorite Disney movie is The Little Mermaid. It just reminds me so much of my daughter's laughter growing up. She would watch this movie everyday. It came out when she was 1 yr old. I am a new follower! YEAH!!! Pete's Dragon is my favorite Disney movie. First movie I ever saw in the theater. I love the detail you put into this! Must have taken forever but totally worth it! Thanks for sharing. Definitely a follower! Super cute!! My all time favorite Disney movie is The Little Mermaid. P.S. I don't know if it's my computer or the previous poster's link but her link sent me to your 1st Disney hop post and not this one. OMG! Your project turned out so cute, I love it! Its really hard to pick out my favorite Disney movie, I love them all! I would say The Little Mermaid. Wow....this is absolutely amazing! Beautiful!! Thanks for the chance to win! Now a follower. my favorite Disney movies would have to be Cars! But I love some of the other non animated movies too! What a fantastic project! My favorite Disney movie (although I love most of them) has to be The Little Mermaid. It's the one all of my family associates with me. Thanks for the chance to win an awesome prize! Ellen, the treehouse is soooo cute! Love it!! It's so hard to pick my favorite Disney movie. Hmmm...I just watched all three "Toy Story"s and LOVED them. But I think my favorite is "Beauty and the Beast"...it's the only VHS tape I ever bought. My all time favorite Disney movie is....Pete's Dragon, have fond memories of going to see it with my family. Amazed at the technology back then. Awesome project and I love your cards! The first movie I took my son to see was "Mary Poppins" so that has to be it! Your project is amazing! I love stopping by all the time to see what you have made! You are very talented! My favorite Disney movies are The Little Mermaid and The Princess and the Frog! Hi! 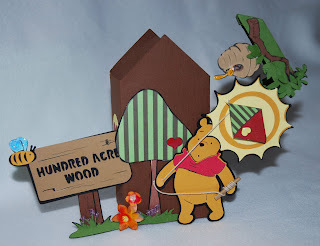 I love the Winnie the Pooh box, very creative! I especially like the paper stick and the kite string - great attention to detail. I am a follower and a fan! My favorite Disney movie is Up. Pooh's treehouse is absolutely adorable. You out a lot of wonderful detail into it. My fav movie s Monster's Inc.
WOW what a great project. THanks so much for your hard work and insperations. My favorite movie atm is Tangled...Who doesn't love Flynn....! Wow What a Awesome Treehouse Box!! Super job!! My favorite Disney movie is Cars!!! TFS!! I love this project!!! I love winnie the pooh movies, but Eeyore is my favorite. I think my favorite Disney movie is Sleeping Beauty, we even name our cat Prince Phillip because of that movie. Please ignore the email I sent, I missed the spot for posting the comment and then realized it after I sent it. Love Disney and this hop. Your work is gorgeous. I already am a follower. Love all Disney movies but from the more recent it would be Toy Story, or that's Pixar so maybe Enchanted. Love them all. Is there a bad one? I love your project, wow, and those special little touches really make it so cute. TFS. My fave Disney movie, hmmmmmm Well Pixar Cars is one, but does that count as a disney movie?? If not I would have to go with The little Mermaid, Ariel is so cute. Thanks for the chance to win. Of course I am a follower, have been for awhile now. Love your blog. I love your project and how creative you are. Thanks for sharing. My favorite Disney movie is Cinderella! I am a new follower to your blog. What a cute pooh box!! I can't pick a favorite Disney movie. I love them all but my top 3 are The Jungle Book, Bambi and Snow White. my daughter would love this pooh bear house!! At the moment my favorite disney movie is toy story 3...my son plays it most days & it gets me a little teary eyed!! Wow ~ this tree house is really cool!!! This is too cute! I definitely think all of the added details, like the kite string, make it very special! I'm a follower! Thanks for the chance to win! My favorite Disney movie is Peter Pan. It was the very first Disney movie that I got to see at a movie theater (many, many moons ago). I am a follower and love visiting your blog. Thanks for the chance to win blog candy. Lovely project! I love that it opens up and the smaller details really do add to it. My favorite Disney movie has to be The Little Mermaid. So adorable! Love your attention to detail-that just makes this project so special! I am already a follower and don't know if I can pick just one favorite Disney movie they are all so fantastic-I guess I will pick Emperor's New Groove because it is so funny and is about a place I love Peru-where my family is from. My favorite Disney movie is "Mary Poppins." This is awesome! 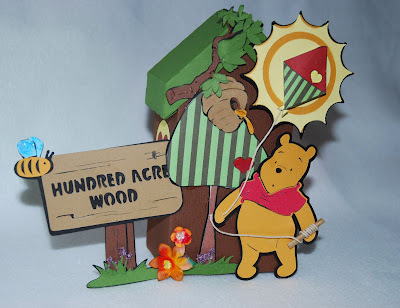 What a wonderful job you did on this adorable Pooh box! WOW!!! What a project!! I love that the tree house is a box that you can put a gift in! I love all the little embellishments that really put the finishing touches on the project! My favorite movie is Cinderella! Already a follower! Thanks for sharing and thanks for the chance to win! I am having so much fun on this hop! Thanks for the chance to win! This hop is alot of fun! Thanks for a chance to win. And I think that Lady and the Tramp will always be special. OMG! This is just out of this world! I totally love it!! So much work, but oh so worth it,LOVE IT! TFS! I am a new follower of your blog & looking forward to all your awesome projects!!! My favorite Disney movie was "The Tiger Movie"... I love Tiger!! Adorable Pooh treehouse! Great job and attention to detail. Thanks for sharing. I am a follower too. My favorite Disney movie is Toy Story 2. This is the 4th time I have tried to comment on her.Keeps going to ask me if I want to make a blog. Frustrating!!!! This project is just absolutly stunning! All of the little details make this project so amazing! I'm a new follower and love your blog! My favorite disney movie is Aladdin. So cute!! Im already a follower of your blog. My favorite movie would be Toy story. Absolutely beautiful, My favorite Disney movie is the 1st Toy Story. Wow, what detailed work. I'm just getting my first cricut and saw yours through the hop, what beautiful work!! My favorite Disney movie? hard choice after all these years I love so many of them. The first one that really amazed me was Fantasia, since i haven't seen Toy Story 3 yet; I'd say my favorite is Mary Poppins with the mixture of real and animation. What an elaborate project. Love it. My favorite disney movie - Lilo & Stitch. EB brought the dvd to our house and we've been watching it!! Thanks for a chance to win some blogcandy. I'm a new follower and your project is just gorgeous--you really put a LOT of work into it! My all time favorite Disney Movie is Mary Poppins! I own 42 Disney VHS tapes (in the process of replacing them all on DVD, but Mary Poppins definitely get the biggest work out! Thanks for your Disney inspiration! Lion King and Beauty and the Beast are tied for my all time favs! Amazing! I love it. Especially the touch of the stick with twine. Thanks for a chance to win. Im already a follower. My favorite Disney Movie is Alice in Wonderland. Just the idea of imagination and fun. Your project is outstanding....you do very nice work. If I had to choose ...best movie...it would be Cinderella. Thank you for chance to win "candy". I just started following your blog. Thank you for the great project! I would have to say that my favorite Disney movie is still The Little Mermaid. I was 16 when it came out and I loved it so much I saw it 10 times in the theater alone! Ratatouille is a close second though. Beauty and the Beast is my favorite. Thanks for sharing and the chance to win.You are now on google and facebook. Opps forgot to leave my e-mail . This is such a cute project Ellen!. I love all the detail. Beautiful!! I love your project very Very Cute!! I love everything about it. Thanks for sharing it with us!! My favorite Disney Movie is the Little Mermaid!! I Love the ocean and I loved this show as a kid. Thanks again!! I love your box. Looks like you put a lot of work into it. Great job. My favorite Disney movie is Aristocats. I remember watching it with my mom when I was young. This is just too adorable. Love Pooh Bear. You did a fabulous job on this! It's amazing! Fav. movie - The Jungle Book! what a great project! nice job! my favorite Disney movie?!? that is a hard one! I think right now it is toy story 3. hard to believe eac toy story was better than the last! I became a follower, too. WOW! I love your blog and am happy to find you and follow your work! My favorite Disney movie is Beauty And The Beast. Always loved it and seeing the play was even more awesome! What an amazing project. So many details. You did a fabilous job. I love it. TFS and a chance to win some candy. I have too many stories that I love, like alice in Wonderland, Jungle Book, Fantasia,All of Poohs movies and the list can go on. I love the layout you did with pooh. Thanks for sharing. Wow thanks for the chance to win I sure can use the gypsy. I don't have one and sure use it. Thanks so much. I have to say the it's still Beauty and Beast. Is your wrist fully healed yet? Cute box. I have so many favorite Disney films. Cars, Toy Story (both) Aladin, Lion King, Aristacats just to name a few. My favorite Disney movie..hmm I love so many of them. Parent trap, lion king, Bambi, Toy Story..
Love your project. Thanks for the blog hop. The movie that I love the most, well that would be hard but if I have to pick then it would have to be Toy Story. What a great project - very clever! Favorite Disney movie? Parent Trap (wow, that was HARD to pick one). Oh my goodness! I love it--such great deals that put it over the top! My favorite Disney movie is Bambi, no wait....Jungle Book, or is it Fox and the Hound?!? Heck I have tooo many favorites! How cute is this!!! Thanks for sharing and participating in the bog hop. Also what IS up with those hats??? lol watching the wedding now,and some of them are hesterical! opps so wound up in the wedding I forgot to tell you my fav disney movie. Mary Poppins! Oh my I just love your Pooh Bear & Tree house.... I LOVE Pooh Bear! My fav disney movie is Cinderella. Awsome!!! I love all the details in this project. It must have taken you a long time to put this together. My favourite Disney movie is Toy Story 3. I couldn't help but cry at the end. Great movie for kids and parents too. Loved Cinderella and Bambi. Guess I'm dating myself. Actually, any Disney is great with a couple of little ones next to me and cookies and milk for a snack. What a great project...so creative starting with the 3-d birdhouse! Love the startled Pooh too! I think my fave Disney movie is Toy Story...with Monsters Inc. a close second! TFS! What a creative gift presentation! Disney is so fun to work with. I cannot be a follower because I don't have a blog, so no candy for me! For what it's worth, my favorite Disney movie is Little Mermaid. Great job on this! Very cute! My favorite movie is Beauty and the Beast-hands down! great project!!! Im a follower! THanks for the hop! What a wonderful project. Super cute. My favorite movie is Dumbo!! OMGoodness Ellen!!! This is beautiful! What an amazing project! Love the little kite stick in his hand. So cute! Fantastic project. Love all the details! My favorite movie is Lady and the tramp. I guess I just love love stories! Sorry, had to delete last comment as I forgot to answer the question. (duh!!!) Anyways, Love, love, love your creation. It is the cutest thing ever!!! Are you sure it can't be the blog candy???? I would love to have it!!!! Lovin' the blog hop again. One of my favourite Disney movies is Mulan (love that Mushu!!!!!) Thanks for the chance to win and for all the inspiration!!! Absolutely adorable. Love all the detail you put into it! 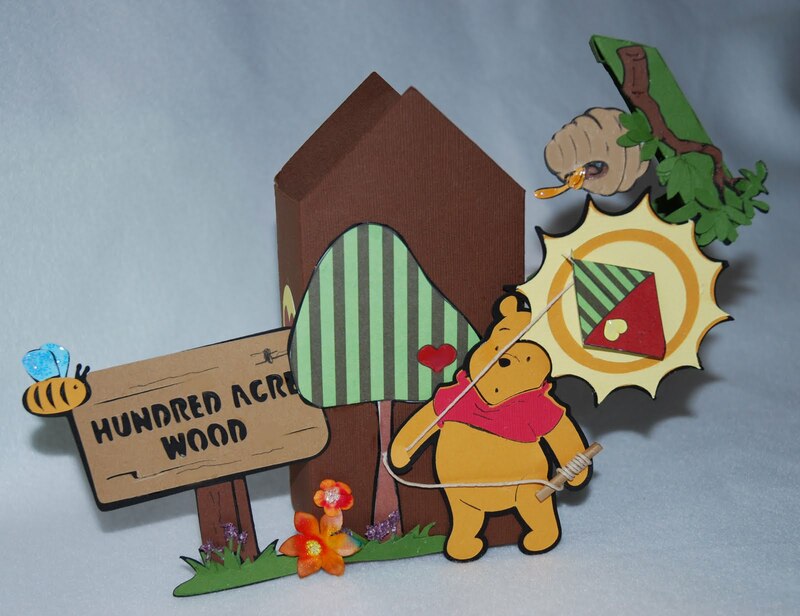 Your Pooh treehouse is darling - love all the detail. Well after posting on the last blog that I have well over 150 Disney movies, it is hard to pick just one...I guess I am going to have to say Beauty and the Beast as it brings back memories of sitting with my daughter when she was little and watching it over and over again. Well, it has to be Winnie the Pooh, of course... silly bear! ;0) TFS! Wow this is such a cool project and love all the details to it. One of my favorite movie would be Beauty & the Beast but there's more other Disney movies I like as well. I look forward to the Disney blod hops! Such a great job on your project!! Gosh I don't even know what one to pick as a fav. 101 dalmations probably. I didn't watch one I didn't like is the problem...L.your project is amazing and I even have this cart, I will just have to make one someday. I am already a follower and love your blog. Hi Ellen, just found your blog while hopping through the Pixar blog hop. My favorite Disney movie has to be Toy Story - when I was a child I imagined my toys played at night so when this movie came out, I just had to have it. Your idea for the house is great! Wow! I love your project! It reminds me of the expensive Disney snow globes my sister collects. I love it....love the details in it. It is really cute and to think it was made from a bird house....very resourceful. As far as a Disney Movie I have seen so many in my time it is so hard to pick a favorite. I would have to say it would be Old Yeller. Absolutely awesome, Ellen! My favorite all time animated Disney movie would have to be Aristocats or Lady & The Tramp or Pooh's Grand Adventure or . . . it's so hard to choose one!! I love them all! Super as usual. I must have gotten lost yesterday, this isn't what I saw. That turned out wonderful, I love so many Disney movies but one is Beauty and the Beast. Love your treehouse box! It is so cute and thoughtfully put together. Great details, too. It's been so long since I've watched Disney movies, but I think my favorite is Aladin. Thanks for sharing and for the chance to win! Girl I love this - is this the diysney cartridge? My favorite new movie is Tangled - Love that she is so spunky and strong. My favorite disney movie is Snow White. Doesn't matter how many times I've seen it, it's always great?! I love the kite and string. It just makes it pop! This is truly awesome! My favorite Disney movie - that's a tough one - I love all of them. I really like Cars a lot, but I will say Cinderella is my favorite. I have been a follower for quite some time. I am already a follower, and just LOVE this project! Thanks for the chance to win!! Darling treehouse! My favorite Disney movie is Lady and the Tramp! I've become a follower, and thanks also for a chance to win! Hi wow you've really gone out of the box with this!!! Your tree house is super dee dooper !!!!! I just love how it opens up too!!! I'm already a follower of your fantastic blog. If your not a follower I suggest that you join you wont be disappointed!!! My favorite Disney movie is Toy Story 1 & 2 because it reminds me of a time when my teenagers were kids and my son would run around with his Woody, Buzz and the whole gang and he'd pretend that he was Andy. I was disappointed how Toy Story 3 ended. I am a new follower. I love this!! My favorite Disney Movie is Alice in Wonderland/ or The Jungle Book. This treehouse is just absolutely too adorable and CREATIVE! I love it! I am a new follower to your blog and will be looking at it very closely. Oops I hit enter before I had a chance to say that my favorite Disney movie is Pollyanna. Love the treehouse, adorable and CREATIVE. Love the tree house. My favorite Disney Movie is Alice in Wonderland. This is a wonderful project. I agree that the little details are so important and I loved the paper stick for the kite string. Thanks for sharing. I am a new follower and I LOVE your project - very cute! My favorite movie - The Jungle Book - my dad took me to see it as a very young girl. Thank you for sharing! currently, the favorite disney movie is tangled. you made a really cute box. i havne't wrapped myself around the svg stuff. Very cute! Such great attention to detail. I am a new follower.